Being a uni student, I am one hundred times more in love with my bed than I should be. There are actual feelings there. This love means sometimes, my personal appearance is slightly neglected and my usual one hour to get ready is cut short. That’s where the five product face comes along.. 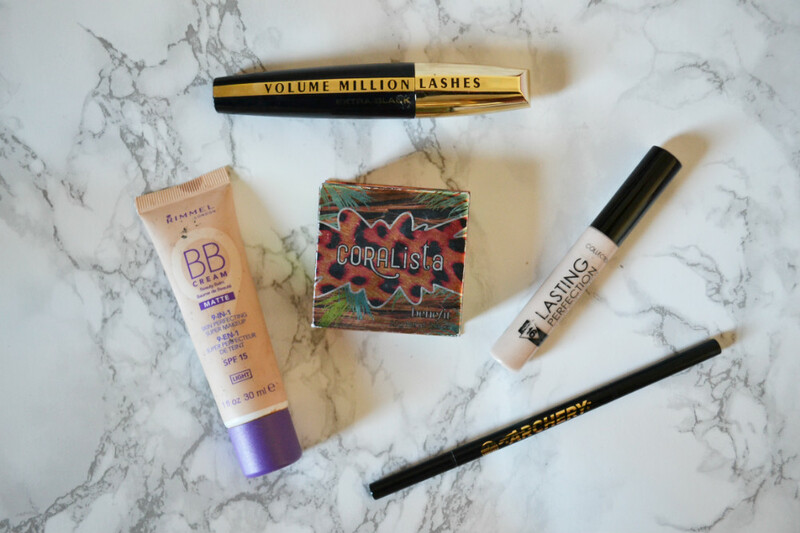 When I need to get ready in a rush, these are my go-to, staple products where I won’t feel me if I don’t have them slapped on my face! For my base I go for the classic lasting concealer from Collection to cover up my dark circles and any pesky spots, and then go in with Rimmel’s bb cream. This is such a light and dewy foundation, it’s lovely to wear. If I feel like I need a bit more coverage I’ll swap this with Rimmel’s stay matte foundation. Next I’ll do my brows, because who even are you without your brows?! For this I use my trusty Soap and Glory brow archery. I’ve used this for years now, and it’s never let me down. It’s perfect for filling in those sparse patches without ending up looking like you’ve adopted two slugs on your face. For lashes my current mascara is volume million lashes by Loreal. I’m not going to rave about this product but it does a good job. I’m always switching around my mascara so give me any recommendations for what one I should try next! Finally, to give me some colour and life in my face, I use coralista by Benefit. This is my all time fave blusher, it’s such a pretty colour. If I feel like a bronzed cheek though, I’ll use Avon’s bronzing balls. Hopefully, with just these 5 products, my face looks decent enough to justify that extra 30 minutes with my beloved bed.